Karti Mayaram received the B.E. (Hons.) degree in electrical engineering from the Birla Institute of Technology and Science, Pilani, India, in 1981, the M.S. degree in electrical engineering from the State University of New York, Stony Brook, in 1982 and the Ph.D. degree in electrical engineering from the University of California, Berkeley, in 1988. From 1988 to 1992, he was a Member of Technical Staff in the Semiconductor Process and Design Center of Texas Instruments, Dallas. From 1992 to 1996 he was a Member of Technical Staff at Bell Labs, Allentown. He was an associate professor in the School of EECS at the Washington State University, Pullman from 1996 to 1999. He is currently a professor in the School of EECS at Oregon State University, Corvallis. Mayaram received the National Science Foundation (NSF) CAREER Award in 1997. 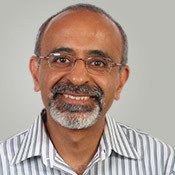 He is a former Editor-in-Chief of IEEE TRANSACTIONS ON COMPUTER-AIDED DESIGN OF INTEGRATED CIRCUITS AND SYSTEMS. His research interests are in the areas of circuit simulation, device simulation and modeling, integrated simulation environments, and analog/RF design. Mayaram is an IEEE Fellow.